The power of Tai Chi can help people who have Crohn's Disease. I know what you are thinking… How can I use Tai Chi and Crohn’s Disease in the same sentence? There are three reasons why Tai Chi can help people with Crohn's Disease! First, this website has been about the relationship of Crohn’s Disease and stress. Consider that one of the purposes of Tai Chi is to relax the practitioner and reduce stress. What if you were better able to relax when you have a flare up? You'd find it far easier than usual to deal with your situation. Secondly, one of the consequences of Crohn’s Disease is arthritis. A benefit of learning this ancient art is flexibility. It can help you fend off and deal with arthritis. “Scientific evidence on the benefits of Tai Chi is piling up. One study presented at the American College of Rheumatology meeting in November 2001 showed that older people with arthritis may have less pain and less trouble with daily activities if they practice Tai Chi." The third reason people with Crohn's Disease should consider this ancient art is that through practice, you will be better able to concentrate, focus and improve your will power. When your Crohn’s is acting up, it will help you to be better able to focus on what needs to be done, either with the disease or with what you have to do in “life” while going through the flare up. Here's some more research for you to consider from the Harvard Health Letter, The Mayo Health Letter, the Journal of American Geriatrics Society, and others. Click here. Tai Chi is a centuries old fitness system with controlled, slow and flowing movements developed to naturally promote both body and mind. There are many forms to learn. And to get really good can take a person many years of practice. So, what's the use you might say. I don't have the time or inclination to spend years getting good at all those forms. You don't have to spend long periods of time practicing to benefit from Tai Chi. Small amounts of time invested every day will help you with your health and fitness. You can even do it before or after work. Even during your lunch break. It doesn't require a large area to work out in and you don't have to shower after you practice. If you'd like to read an article that goes into more detail Click here. Here are two great videos for people who don’t have a lot of time to practice the forms, but would still like to enjoy the benefits for their body and mind. * Tai Chi for Busy People™ truly is revolutionary. A step by step video tape or DVD that is interesting, fun, and easy to follow. It is filled with fascinating bites of information, stunning scenery and a ‘straight to the point’ method of teaching - a method perfected by Dr. Keith Jeffery after years of international training and motivational tai chi seminars. Click here for more information about Tai Chi for Busy People. * 4 Minute Fitness - This new More than Movement exercise video offers dynamic principles taken from t'ai chi, yoga, meditation and ancient qi gong (chi kung)... ...combined with vital modern medical theory, relaxation techniques and key motivational techniques used by today's athletes. Use 4 Minute Fitness as a tool to "gear up" before work, to be more present when the kids come home, to relax and energize anytime and to sleep more deeply. 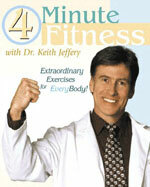 Click here for more information about 4 Minute Fitness.